Creating spaces that tell stories about people. 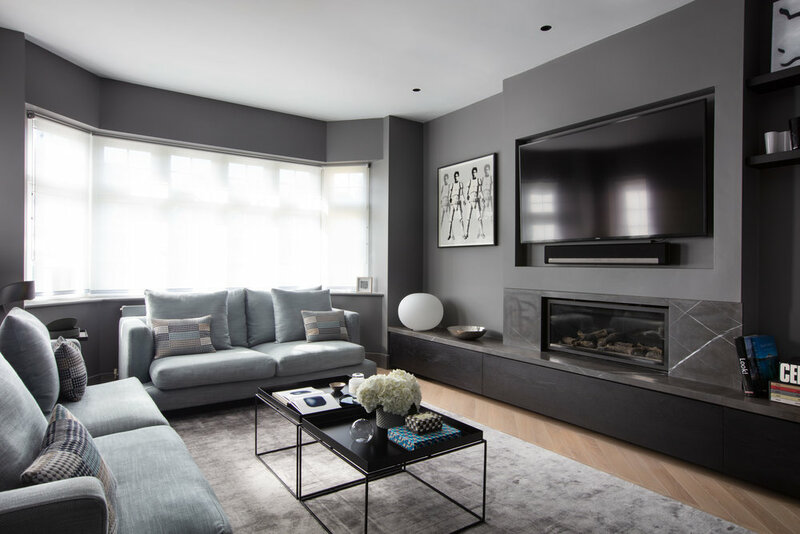 Redefining the living spaces of a family home using new finishing materials, working with a restricted colour palette of muted blues and greys. Occasional bursts of colour and pattern in the soft furnishings and distinctive artworks add character and individuality. Bespoke joinery and stone work were commissioned to add a more coherent framework to the interior spaces. 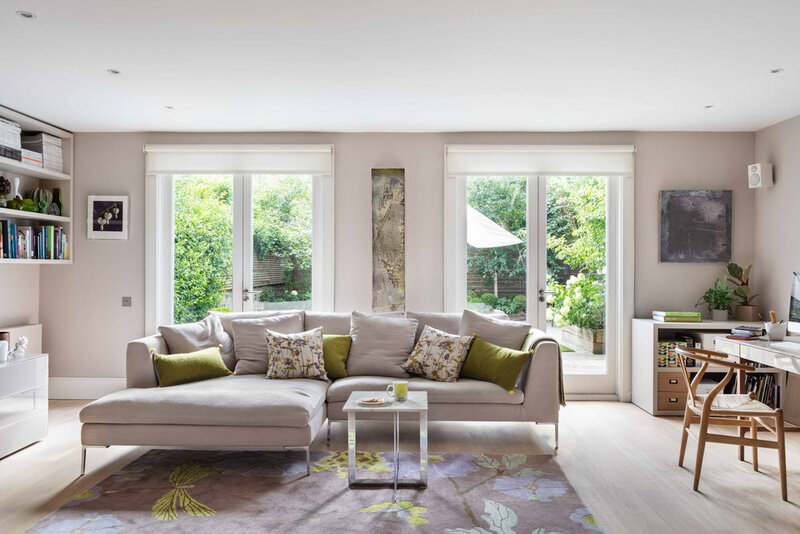 This well proportioned family home was given bold styling to complement its Victorian architectural heritage and create a sense of transition between rooms. Walls were painted with modern architectural neutrals providing a backdrop to a mix of modernist classics and vintage furniture pieces. Artworks, textiles, lighting and accessories add layers of interest with colour and pattern. The vertical design of the hallway wallpaper plays to the generous ceiling heights. Richer colours were used in the bedroom spaces to create a sense of cocooning. 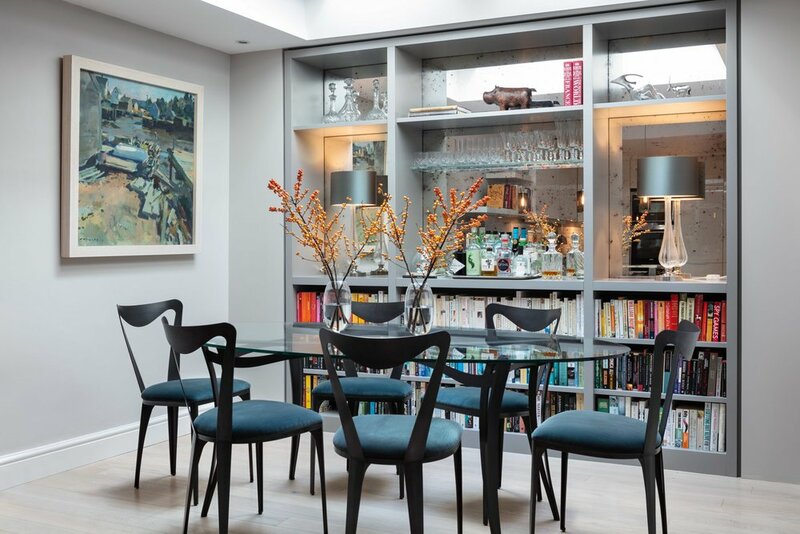 This project focused on furniture procurement, interior styling and the commissioning of a number of pieces of bespoke joinery in a mews house. The clients, a busy family, wanted a purpose built shoe storage facility to conceal inevitable hallway clutter. A free standing, narrow console unit was designed to accommodate shoes with a colour finish to tone with the artworks displayed above it. The dining area was given a fresh treatment with full height shelving to store books and display barware and table lighting. The antiqued mirrored backing was added to give depth and ambience, especially after dark. 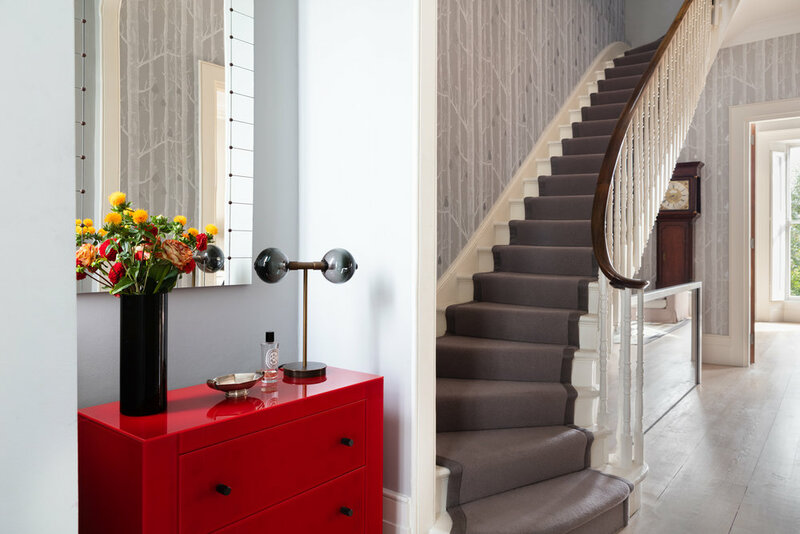 Advice was given on the detailing of a new internal staircase configuration to connect to the new basement extension. 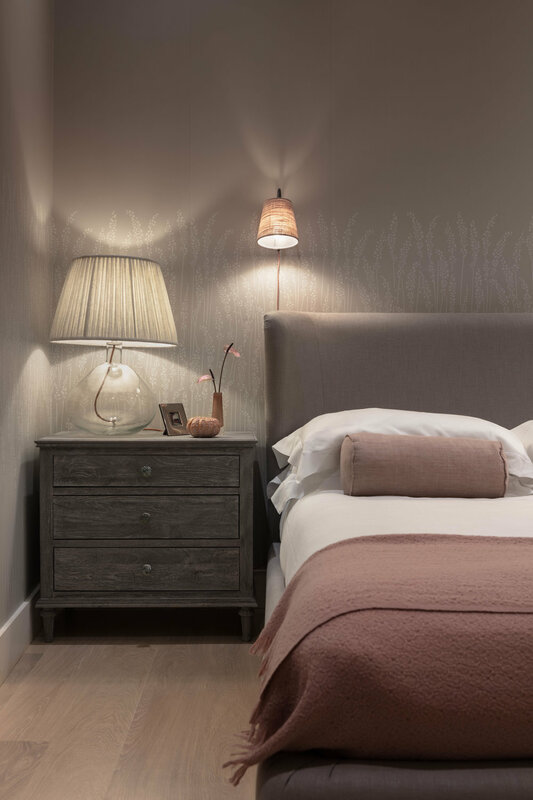 A guest bedroom was given a calming feel with a Farrow & Ball botanical print wallpaper and feminine details in the interior hardware and colour accents. 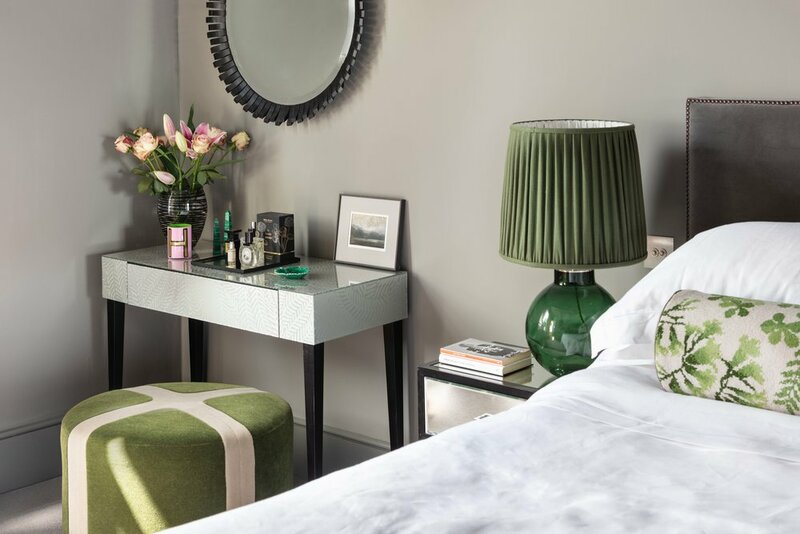 The choice of furniture, lighting, accessories and styling was guided in colour and personality by the lively, vibrant artworks and objects in the clients’ collection. Exterior joinery included a new front door and adjacent half glazed door partitions to suit interior repurposing to a home office. Careful consideration was given to the exterior elevation to complement the overall character of the buildings in the neighbourhood.